The Carmelite Institute is a place where people come to drink of the spirituality of Christ in Carmel. It is a place to learn about the spiritual life of Christ within us. It is a place for quiet reflection and recollection, a place to be still and “See that I AM.” It is a place to bring the life of God to God’s children in the language of the Church and Carmel. It is a place to assist in the growth and development of the spiritual life for whomever discerns a call to union with God. It is a place to come for Prayer, for spiritual direction. It is also a place from which the Institute goes out to other places to share that spirituality by giving missions to parishes in Western Washington and retreats. St. Therese described her mission as that of “evangelizing the evangelists.” Spirituality does just that, as it brings the light of the Gospel to the deepest recesses of our beings and teaches us to draw on the lifegiving Spirit of Christ as we face the challenges of our day, challenges for which there are few clear answers. We need to be able to draw on the Gospel and to know how to listen to the Spirit who calls to mind what Jesus has taught us. In that way, we will be able to discover the presence of our saving God in all the circumstances of our lives. 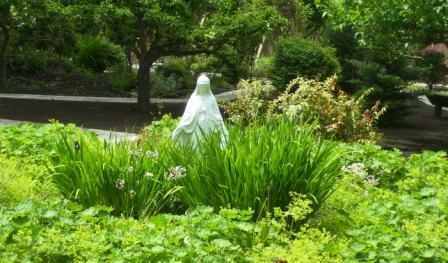 Our St. Teresa Retreat House and Meditation gardens are wonderful places in which to learn about the spiritual life and to reflect on your relationship with Christ. Our St. Teresa Retreat House provides daily and overnight, individual or group accommodations for an intimate place of retreat from the hectic pace of everyday life. We offer a chapel, a fully equipped kitchen, meeting room, large dining refectory, and a huge outside deck with private meditation garden. These are self led retreats unless an appointment is needed with our pastor from St. Cecilia’s church. We have four bedrooms; all of them have two twin beds complete with bed linens and towels. One room has a private full bathroom. The other three bedrooms share two full baths. Throughout the year, we have monthly Days of Recollection during which we usually gather on the 2th Saturday (unless there is a holiday) and have a group retreat on different topics. Sometimes it is on specific Saints or it could be on The Transforming Power of the Holy Cross. Please see our calendar page for dates, times and programs. During a month with a holiday or for another reason, the Day of Recollection may be on a different Saturday of the month. Again, this will be posted in the St. Cecilia bulletin and on this website. Spiritual direction is a time-honored term for a conversation, ordinarily between two persons, in which one person consults another, more spiritually experienced person about the ways in which God may be touching her or his life, directly or indirectly. It can be helpful when you are making important life decisions and to discern how God is inviting you to that decision. We have two certified Spiritual Directors that volunteer their services to help individuals with their spiritual development. Introductions to the Spiritual Directors and appointments can be made by calling the office 360-629-4032.